AUBURN HILLS, Mich., Nov. 9, 2018 /PRNewswire/ -- The Fiat 124 Spider Abarth takes a starring role alongside Sting & Shaggy in the official music video for their new track, "Gotta Get Back My Baby" – the latest single, co-produced by Teflon (Wyclef Jean, Fat Joe, Ruff Ryders) and Martin Kierszenbaum (Sting, Mylène Farmer, Lady Gaga), off their album, 44/876, which has spent 17 weeks atop the Billboard Reggae chart. The official YouTube music video, which amassed over 2.3 million views in just a few days, was filmed in the vein of '80s and '90s buddy cop television series and movies including "Miami Vice" and "Bad Boys," and was directed by Michael Garcia. 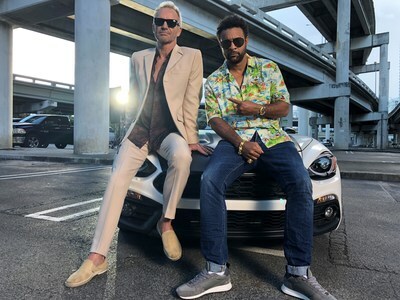 The video pairs Sting and Shaggy as two Miami detectives who convince their Captain that they're "going to need the Spider" – meaning his prized Fiat 124 Spider Abarth – as part of their South Beach stake-out for "the most dangerous woman in the country." What could go wrong?! "We continue to strive for the unexpected in our marketing efforts across all FCA brands, and certainly here, the FIAT brand's fun-spirited personality gives us the opportunity to be just a little bit more adventurous and playful in our approach with our music partners," said Olivier Francois, Chief Marketing Officer and Head of the FIAT Brand, FCA. "The Fiat 124 Spider Abarth is incredibly honored to play the role of side-kick to such legendary and audacious artists as Sting and Shaggy in their latest music video." Sting & Shaggy's album 44/876(Cherrytree/A&M/Interscope Records) is available now for digital download through streaming and digital subscription services. The iconic duo initially joined forces to record a new song, "Don't Make Me Wait" (which debuted at #1 on Billboard's digital reggae singles chart), as a tribute to the Caribbean sounds that influenced them both and ended up creating an entire album full of joyful and uplifting, melodic music. With its title referencing their respective telephone country codes (44 for the UK, Sting's birthplace and 876 for Jamaica, Shaggy's homeland), 44/876 honors the duo's deep-rooted love for Jamaica: Shaggy's birthplace, and where Sting penned such classics as "Every Breath You Take."